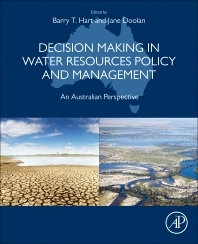 Decision-Making in Water Resource Policy and Management: An Australian Perspective presents the latest information in developing new decision-making processes. Topics covered include key aspects of water resources planning, recent water resource policy changes in irrigation, urban, and environmental considerations, the evolution of a water market, a number of case studies that provide real examples of improved decision-making, transfer of the Australian experience overseas, and challenges for the future. Many countries are experiencing major water scarcity problems which will likely intensify with the continued impacts of climate change. In response to this challenge, there is increased worldwide focus on the development of more sustainable and integrated water resource policies. The Australian experience over the past three decades has led to major improvements in the decision-making processes in water resources policy and management, particularly in response to drought and climate change, providing a great model on which other nations can use and adapt. This information is essential to early to mid-career practitioners engaged in policy, planning and operational roles in all fields of water resource policy and management, and catchment management. Professor Barry Hart is Director of the environmental consulting company Water Science Pty Ltd. He is also Emeritus Professor at Monash University, where previously he was Director of the Water Studies Centre. Prof Hart has established an international reputation in the fields of ecological risk assessment, environmental flow decision-making, water quality and catchment management and environmental chemistry. He is well known for his sustained efforts in developing knowledge-based decision making processes in natural resource management in Australia and south-east Asia. Prof Hart is currently a board member of the Murray-Darling Basin Authority and a non-executive Director of Alluvium Consulting Australia Pty Ltd. He is also Deputy Chair of the Scientific Inquiry into Hydraulic Fracturing of Onshore Unconventional Reservoirs in the Northern Territory, which commenced in December 2016.He has received several awards, including the Limnology Medal (1982) from the Australian Society for Limnology, the Environmental Chemistry Medal (1996) and Applied Chemistry Medal (1998) from the Royal Australian Chemical Institute, a Centenary Medal for services to water quality management and environmental protection (2003) and was made a Member of the Order of Australia (AM) in 2012. Professor Jane Doolan is a Professorial Fellow in Natural Resource Governance at the University of Canberra. She has extensive senior leadership experience working in sustainable water resource and environmental management, having provided policy advice to governments on issues such as urban and rural water supply and security, national water reform, and water sector governance. She has driven important initiatives in river health, environmental water allocation and catchment management, and the management of water during drought and climate change. Her career encompasses intergovernmental policy development and negotiations, particularly in relation to the management of the Murray–Darling Basin. Previously held positions include Commissioner with the National Water Commission and Deputy Secretary for Water in the Victorian Department of Environment and Primary Industries. She is currently the Chair of the Murray-Darling Freshwater Research Centre and a Director of Western Water Authority.